For the longest time, I, much like a lot of other people, was under the belief that socks with sandals was always, always a no-go zone. But I think it's like double denim in a way, one of those things that everyone thinks is terrible, when really, if you style it in the right way, it can work out so good and make a real fashion statement! I'm all about simple outfits accessorised in a way to make them stand out, whether that be with a bag, shoes, a hat or even socks! I got full inspiration for this trend from a number of other bloggers and it has taken me a while to think that, yeah, I could rock that look. 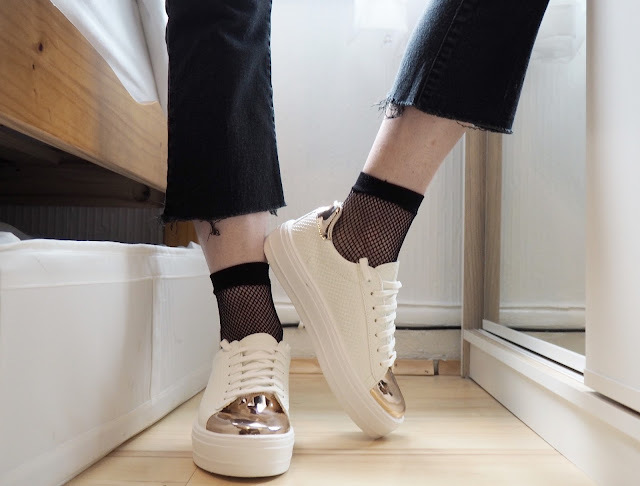 I just think that, whether with a pair of kick flare jeans, an a-line skirt or some shorts, a pair of patterned ankle socks with your shoes can add a real edge to your outfit. They also work with so many different shoes, from heeled sandals to trainers, whatever your style. Whenever I was shopping I'd always forget to look at socks, does anyone else have certain sections in shops which they just never venture to? I always ignore the socks! So I just went onto amazon the other night, searched 'fishnet socks' found a pair for around £2 and the same seller had numerous other designs, so I ended up with these 3 pairs. I love the style of each of them and think they're perfect for such an array of outfits! Very much a marmite style I expect, are you a fan or not?